Need a gift for a baby shower? Fear not! This is the design for you! With the adorable graphics and fun colors, this design will surely get several oohs and ahs at the shower. Put this design on a little hat or blanket! Go all out! This design is for a new baby boy. The background is a bright teal color with baby bottles and safety pins. The secondary background has blue, teal, and green raindrops with a soft yellow behind them. The teal background almost acts as a frame around the yellow background. 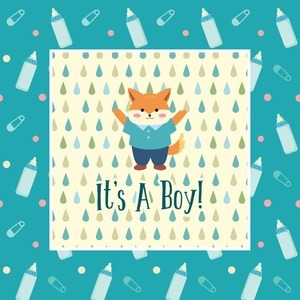 On the yellow background there is a fun little fox graphic celebrating with the words underneath him: "It's A Boy!" Easily change the patterns and graphics! Not a baby boy you are celebrating? No problem! Change the colors from blue/teal to pink! Change the text to "It's A Girl!" Change the graphic to a sweet pink bunny! The options are endless. If you aren't finding exactly what you need, get in touch with us! We are always happy to help you fulfill your designing needs.